Morning view from my balcony at Him Naam Pai resort. At 7:00am everybody was good to go ! 😀 The starting point is Medio De Pai the boutique hotel in the city. 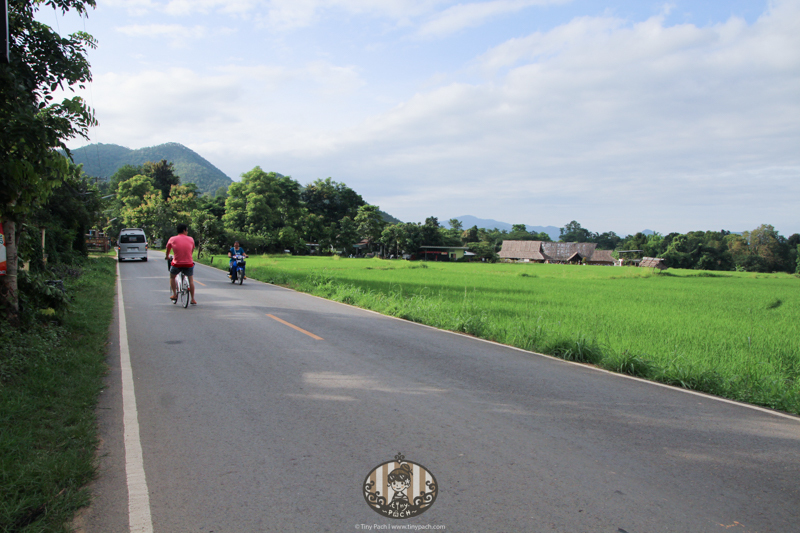 For the bicycle you can rent or borrow from your accommodation providers (85% of hotel in Pai offer free bicycle for their guests). From the map you will see two optional route (red line and purple line). The difference is if you choose route 2, you do not have to travel back to the same direction. The total distance is approximately 8 kilometres. Baan Katisod was the stop where we enjoyed our refreshment drinks from P’Kati, the owner of this environment friendly guest house. Our brunch took place at Baan Pai restaurant. Most of the menu were typical Northern food which was a bit too spicy for me lol. The afternoon plan started at Love Strawberry Pai. This is where you can find a comfy accommodation and interesting acitivity at Pai. Once I stepped inside the place there was a stall of homemade wine where all guests can taste the product before they make a decision of what they want to buy. The example of available beverage types areLychee wine, Strawberry juice and wine. The manager at Strawberry Love Pai was proudly presented this Giant Swing which is the newest activity at this place. She said the wire rope can support up to 120kg. Yunan Chinese Village was another stop on the third day at Pai. This is where the imitation of the Great Wall of China located. Shop and restaurant are located inside the village. You can purchase a bag of tea leave or Chinese charm from the store and the price is affordable. I strongly recommend you to visit Doi Kiew Lom if you have a chance. The route may look a but tricky but I swear once you get up there you are going to forget how hard it was to drive up there 🙂 The scenery on the top of Doi Kiew Lom is unexplainable and incredibly stunning. Baan Kung Kang was the one who supported my third night accommodation. The whole room is decorated with Old European design. The bathroom and toilet are separated from each other by the sink which is located in the middle of those two rooms. The buffet line was not prepared as it was low season but I can ordered freshly cooked breakfast from the staff at Baan Kung Kang. The American breakfast came with roselle juice. After I finished my meal, the van was there on time (good timing hehe). Time to say goodbye to Baan Kung Kang and Pai. We stopped at Pankled Coffee for our lunch. At Pankled coffee, they have all kind of beverage such as smoothies, coffee, fresh juice and general drinks like iced cocoa. My iced chocolate 🙂 all time favourite drink. For hot meal, I ordered stir-fried mince pork with chili and basil on rice.